Finding a commuter parking spot at UWG may be more difficult than you expected. Just finding a parking spot may be a difficult to impossible task. With the recent growth trend at West Georgia, the main casualty has been parking that accommodates commuter students. 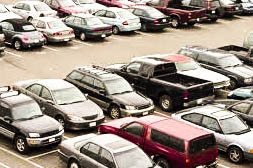 Parking at Tyus and the Z-6 is mostly taken by students who live on campus. The TLC and Townsend Center parking is already limited to begin with, and fills up quickly. UWG senior, Justin Anderson, blames the lack of parking on a oversight by the University. “I think the University became so focused on growing and adding new students that they forgot to make enough room to accommodate everyone. The lack of parking shows that,” Anderson said. With parking spots on campus all but gone most of the day, students are now forced to make adjustments. Some students have resorted to parking at the University’s football stadium. Yes, I am referring to the stadium that sits a considerable distance from the campus. Luckily for those students, there is a shuttle to take them to and from the stadium. For some commuter students, this is one of very few options to use. Robert Barnhart, junior, commutes from Newnan three times a week and sees little alternatives. “When you don’t live in Carrollton full-time, you have to think of something. The parking looks really bad this year, but you have to deal with it,” said Barnhart. The other solution is the more obvious one: the apartment shuttle. The operative word being obvious; more students are using the shuttle now than at any point last year. During the morning rush, residents of Campus Quad can fill the bus in one stop. This means that students from River’s Edge, Rivers Pointe, and The Grove will have to stand in the aisle. Then, once there is no more space, students will have to wait for the shuttle to come back. The solution on the mind of every commuter is to add another bus to the apartment route. Sophomore Mariah Robinson thinks it is a necessity. “I think it’s ridiculous. The least they can do is run two buses so people can get to where they need to go,” said Robinson. The University’s Parking and Transportation Department have been actively finding new solutions to accommodate students who need to get to and from campus. This includes sending an additional shuttle during the morning rush. The Parking and Transportation Department remain committed to providing the best possible service for all students. For now, commuter students will have to make do with the services provided by the University. The apartment shuttle will remain the favorite for students that live in apartments. Other commuters will have to take the parking available to them where they can find it. Until further notice, parking will remain a game of chance.